Hello guys. Wow, I cannot believe October is over and Christmas is just a couple of weeks away. Of course, we get to celebrate Thanksgiving before then. I just love the holiday season i.e. the decorations, food and the priceless company of family and friends. I am looking forward to Nolan’s first Christmas and the excitement of putting up our Christmas tree. I have already ordered his “first Christmas” stockings from Pottery barn…next will be Christmas shopping. I am equally excited about the fall season especially the changing colors of leaves that fall from the trees. 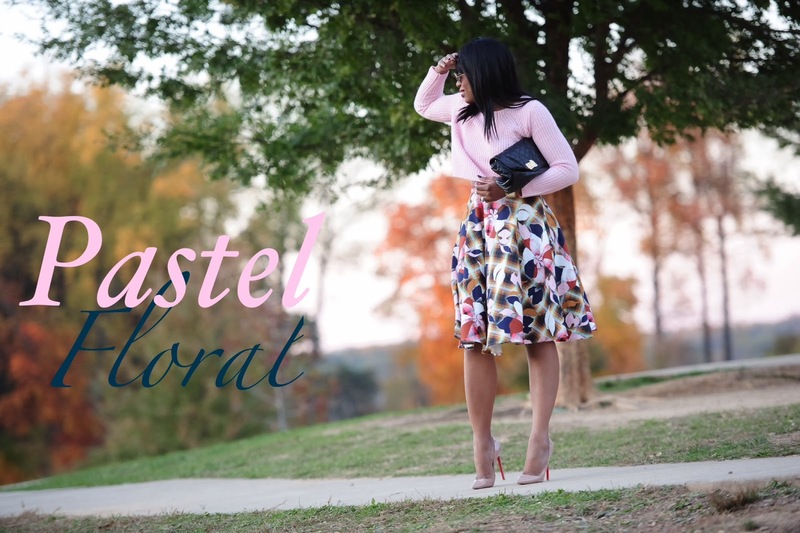 Apart from the usual fall color tones such as burgundy and mustard, I love pastel colors for this season. 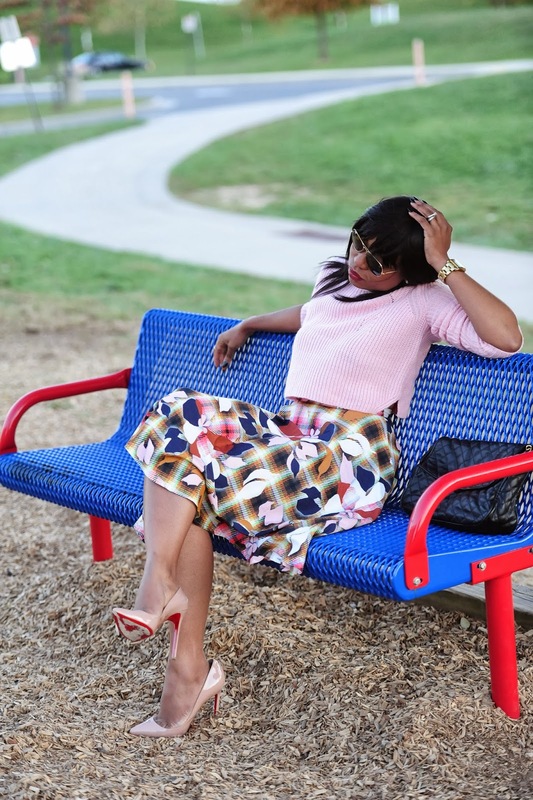 For this outfit, I mixed a pastel pink sweater with a floral print midi skirt. 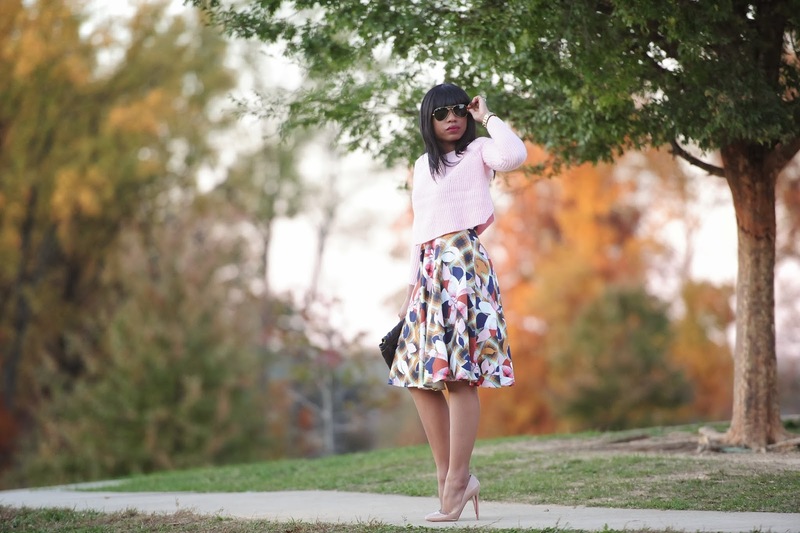 I love the floral colors of the skirt because it incorporates a mix of pastel and warm colors. This makes it suitable to wear both in the fall and spring. Keeping with a neutral theme, I wore beige pumps. I completed the look with a dark clutch and burgundy lipstick, which pops out the color tones of the skirt without being overbearing. gorgeous skirt... your style is impeccable! Gorgeous skirt! The prints on it are sooo pretty. Love! I love the paste colors. So feminine and pretty on you. My Favourite outfit to date. The skirt is pretty! love it! can't stop staring at the sixth pic. Awwwww @ Nolan's first christmas...I'm excited for u guys. That skirt is so pretty!!! Your skirt is absolutely gorgeous! Love this look. looking fabulous as always.lovely skirt. Such a pretty perfect skirt. love the skirt, too cute!! 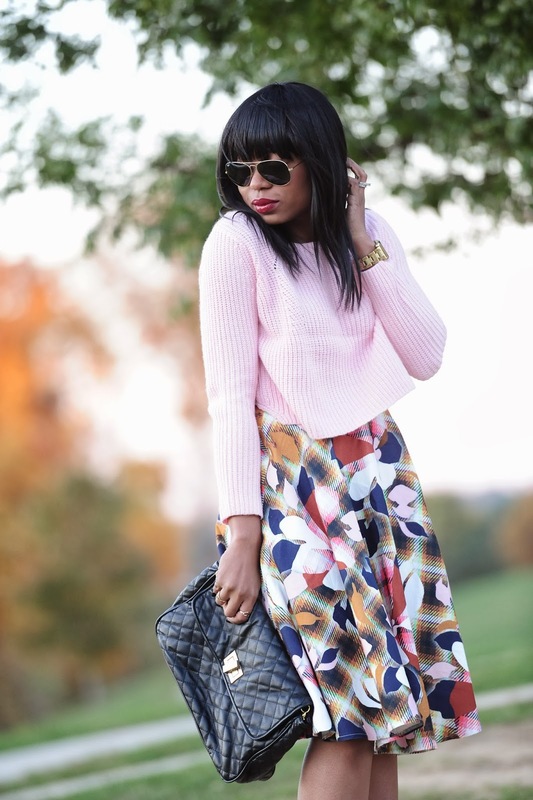 Pastels are definitely IN this fall, and this outfit looks fab on you! Very pretty colors and the scenery is breathtaking.